This is part III in a mini-series of Harry Potter snacks from the books brought to life (part I is on Honeydukes treats, part II is all about the cauldron cakes, and part IV showcases decadent butterbeer cupcakes). Last August, my family made the two thousand mile journey to the Wizarding World of Harry Potter at Universal Studios. Orlando has always been one of my family's favorite vacation destinations. Add in my love (and obsession) with Harry Potter and we all knew that once the park officially opened I couldn't be kept away for long. On the big day, we woke up at an obscene hour to a bright dawn. While the rest of my family was dragging their feet and speaking in yawns, I was too excited to dwell on my lack of sleep and tired eyes. I had been waiting for this day for years. I was running on sheer adrenaline. When I entered the park, I was immediately swept away by the architecture and the detail. The park truly has the atmosphere, look and feel, and sights and sounds (well, if you don't count the occasional woosh from the rollercoasters) of the world of Harry Potter I had imagined. I could have spent hours walking up and down the cobblestone streets simply admiring the tremendous amount of detail that was put into creating this world. Even the subtlest objects, mentioned only briefly in the books, were now here in front of me, fully imagined. I'm pretty sure I had a grin on my face a mile wide. Believe it or not, "window shopping" was one of my favorite sights in the park. There were dozens of little shop fronts with windows that each lead into a tiny world. The level of detail was so unbelievable, it was almost overwhelming. I didn't know where to look next. However, I did notice that, like any good wizarding shop, many objects would move of their own volition (but only if you took the time to spot it!). Cauldron shops, music stores, clothing boutiques—I just wish they had all been real. After riding the attractions, it was time to sample everything Hogsmeade had to offer. First on the menu, Butterbeers. My family decided that we each wanted one to ourselves (when you stare at them while waiting in line for an hour, you tend to get a bit greedy). Since it was a hot day, we opted for the frozen version. Were the Butterbeers what I had imagined? Not quite. Was it delicious? Absolutely. My sister and I both found them a little too sweet for our liking (that fact that it was nine in the morning may have played into it a bit), but I still managed to drink mine down to the bottom of the glass. The recipe for Butterbeers I've posted here features a less sweet version than you'll find at the park. We came back to the park later in the evening to see how the look and feel would change after the sun had set. With all the lights dimmed to nothing but a soft glow, the park felt truly magical. Despite the hustle and bustle of busy crowds, for the first time I didn't feel like I was at a theme park anymore. I had been completely transported to the world I could only dream about before. I think these photos tell the story better than I ever could. This was the perfect ending to what I can only call a perfect day. 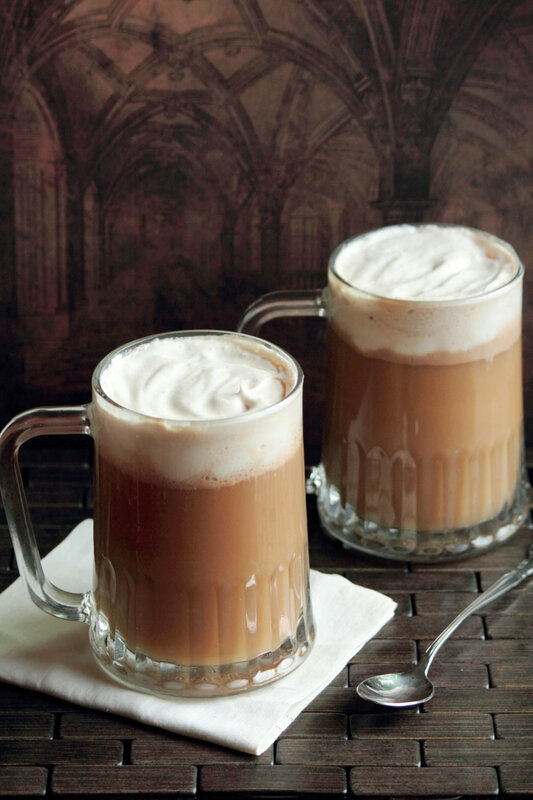 These Butterbeers are rich, fun, and fizzy. Your favorite drink from the Harry Potter series is now available to muggles like you! 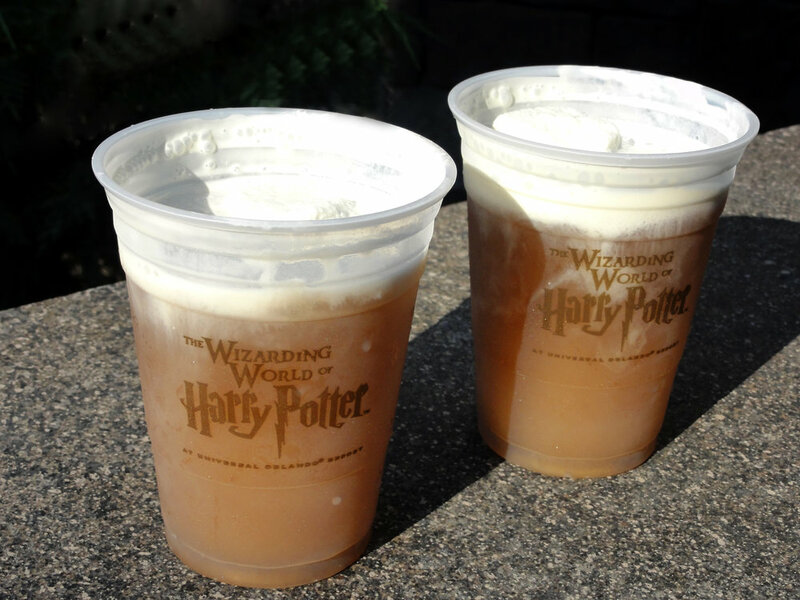 The Butterbeers are created by mixing a butterscotch/caramel syrup into cream soda and then topping it with a healthy dollop of butterscotch infused whipped cream. When taking a sip from the mug, you will get a whipped cream mustache. Trust me, it's all a part of the novelty. Fair warning, these drinks are on the sweeter side, so make sure to bring your sweet tooth along (not that it has ever been a problem for me!). In a small saucepan, combine brown sugar with 2 tablespoons water. Bring to a boil over medium heat and cook until the mixture reaches 240 degrees F (115 degrees C) on a candy thermometer, stirring occasionally. If you don't have a candy thermometer, bring to a gentle boil and turn off the heat after about a minute of cooking. Turn off the heat and add the butter, salt, vinegar, and 1/4 cup heavy cream. Stir until smooth. Cool mixture to room temperature before using. In a medium bowl, beat together the remaining cream (1/2 cup) with 2 tablespoons of the brown sugar syrup. In each glass, mix together 1/4 cup brown sugar syrup with 1/4 cup cream soda. Pour in the rest of the cream soda until it is nearly to the brim of the glass. Top with whipped cream.